gardenias and birthdays – jen wewers, m.div. 2. I live in a house of boys so none of them would ever light a candle for purposes other than playing with fire. I smiled. It was mom.The scent of her favorite flower filled the air. Max’s birthday was a week away. This year my baby’s 12th birthday is also the first anniversary of my mom’s death. Today I celebrate both of them. A year ago Mom was in ICU at KU. We never in a million years thought it would be her last day with us. On most days I still don’t believe it was. I know that sounds crazy, but it’s true. 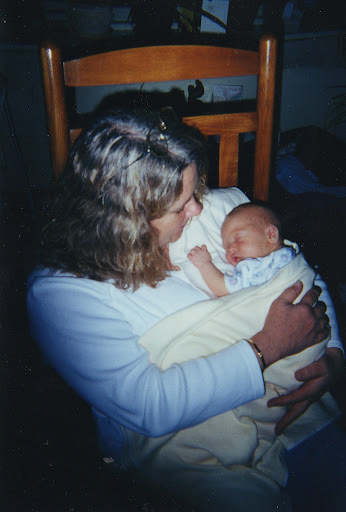 Nani with Max at one week old. On this day last year she could see the date on the calendar APRIL 10. I was at her bedside and she was frustrated because I was there with her and not home with Max. I knew Max could wait. But true to form, my mom thought the most important place for me was at home being mom to my son. I, instead, chose the moment for being daughter to my mom. As soon as she left us though, I did the only thing I knew to do. I drove out of the KU parking lot to my local Price Chopper and bought a chocolate birthday cake, chocolate ice cream and candles for the cake. And that night only a few hours after my mom died, all of us still in shock, sang “Happy Birthday” to my mother’s only grandchild. I straddled both generations so completely that day. Initially, I was so upset that Mom’s death and Max’s birth are forever tied together. I have thought a lot about this over the year. How would we handle this day? What would I do to best honor my mom and her love for all of us? Would I drive to Leavenworth and leave flowers on her grave? Would I plant a new flower in my backyard? Would I perform some sort of ritual? And then I realized the best way to spend the day is simply to be the best mom I can be for Max. And by doing so I honor her and what she valued most in this world – being a mom.